Maryland state agencies have reported their progress in implementing the Coast Smart Construction Program, a statewide effort to address impacts from coastal flooding, storm inundation and sea level rise on state-funded building projects. 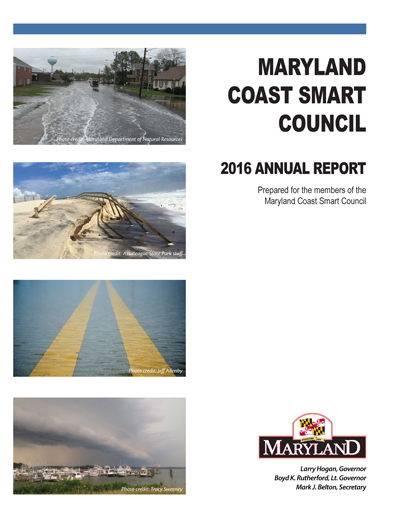 These initiatives are recorded in the first Annual Report issued by the Maryland Coast Smart Council, established by the Maryland General Assembly in 2014 to establish specific siting and design criteria to address resiliency for projects planned and built by the state. The council, staffed by the Maryland Department of Natural Resources and chaired by Secretary Mark Belton, includes representatives of several state agencies and local governments along with academics and private sector experts. The Maryland Department of Budget and Management, Department of General Services and Department of the Environment have taken steps to institutionalize this criteria into the appropriate architecture, engineering, construction and design manuals for state infrastructure. The Maryland Emergency Management Agency updated the State Hazard Mitigation Plan, identifying pathways to a safer Maryland. The Maryland Department of Transportation State Highway Administration has incorporated sea level change data out to the year 2100 to proactively identify critical infrastructure at risk to coastal flooding and sea level rise, and where to direct future projects. The Maryland Department of Natural Resources worked with partners to identify where forests, wetlands, sand dunes and other habitats protect vulnerable communities and are proactively targeting restoration opportunities to reduce risk.